“We are continuing to move forward, to act with full force, as well as to expand our activities and help other people,” said International Fellowship of Christians and Jews Fellowship president Yael Eckstein, honoring the memory of her father, Rabbi Yechiel Eckstein. A young girl helps pack boxes containing food and other items to be sent to Jews in need. Credit: Federation of the Jewish Communities of the Commonwealth of Independent States. 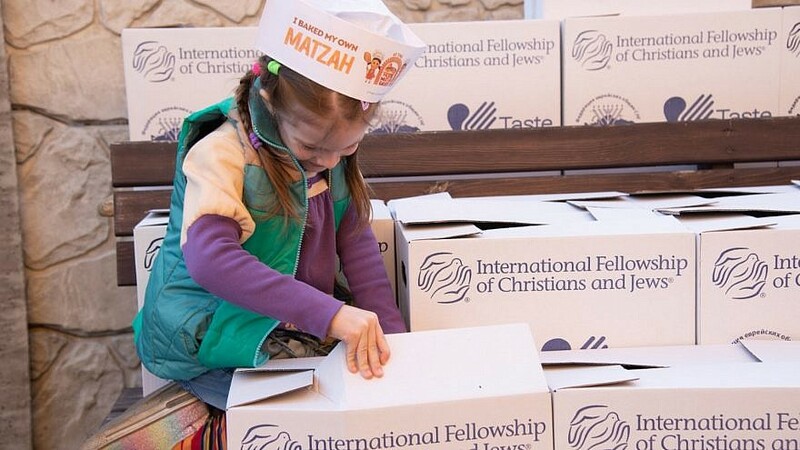 (April 15, 2019 / JNS) The International Fellowship of Christians and Jews is sponsoring tens of thousands of Passover food packages for 120,000 Jewish families living in the former Soviet Union, made possible by Christian friends of Israel. The Federation of the Jewish Communities of the Commonwealth of Independent States, alongside CHAMAH and the American Jewish Joint Distribution Committee, is distributing the items to Jews in need. This year’s distribution of Passover food packages is being dedicated in memory of Rabbi Yechiel Eckstein, the founder and previous president of the Fellowship, who passed away in February. “Passover is a holiday for the family, but for me and for the Fellowship, this is the first Passover we are celebrating without the head of the family—my father, the late Rabbi Yechiel Eckstein,” said Fellowship president Yael Eckstein. Included among the 37,000 food packages are 150,000 boxes (36 tons) of matzah, and 75,000 bottles of wine and grape juice. Each food box has a monetary value of 15 percent the average monthly salary in Ukraine, where the food packages will be delivered in addition to Russia, Belarus, Uzbekistan and Azerbaijan with the help of the respective rabbis and emissaries of the Chabad-Lubavitch movement. The Fellowship is also helping approximately 15,000 Jews from some 260 communities throughout the former Soviet Union participate in communal Passover seder ceremonies. Simultaneously, the Fellowship is distributing payment cards for food and clothing to 80,000 vulnerable members of Israeli society, among which include lone soldiers, the elderly those eligible for economic assistance and families on welfare.